“A good example is site-configured registration workflows. 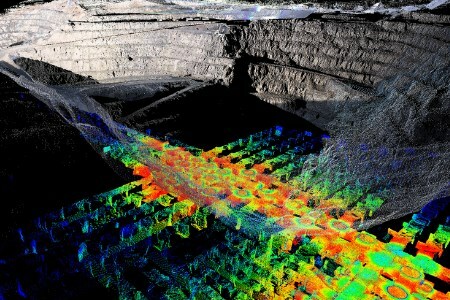 This incorporates data import and filtering, as well as all the steps required for getting a registered point cloud ready for processing and analysis,” commented Howarth. “Undocking views when running multiple monitors helps users compare plans against as-builts, improving interpretation. Users can create their own toolbars, menus and shortcut keys to suit individual work patterns. Customers rely on Maptek to provide the most flexible and versatile mine measurement tools an operation can deploy. The same innovative technology delivers survey, stockpile management, highwall mapping, geotechnical analysis, and stability and convergence monitoring. “PointStudio 8 marks the beginning of a new era in desktop tools for processing and modelling 3D spatial data,” said Howarth. “It’s 20 years since we first started work on ground-breaking tools that could actually handle the huge volume of point cloud datasets. Because early laser scanner technology was less sophisticated, Maptek built in smart workflow and visualisation features from the beginning. “This has proved a solid foundation. Better optics, electronics and higher definition cameras in the Maptek R3 series scanners have now allowed us to concentrate on more powerful, integrated functionality for surveyors, geologists and geotechnical engineers. ”The Maptek brand has evolved considerably over the past 37 years. Changing the name of our software to PointStudio does not alter our commitment to developing and supporting spatial mining solutions,” Howarth concluded. PointStudio 8 was released to global customers this week.